This steep climb up a forested ridge rewards hikers with two small Alpine lakes cradled in a basin between Brokeoff Mountain and Mount Diller. The beginning of the trail winds through ferns, grasses and wildflowers including Mules Ear, Indian Paintbrush and Lupine. Stops along the way provide glimpses of the Sulphur Works hydrothermal area and Sulphur Creek. The trail then switchbacks through Forest before following a ravine up to the lake basin. Good views of Mount Diller can be seen along the way. Although challenging, this hike offers visitors an opportunity to experience Lassen's alpine terrain in a short hike. The Sulphur Works parking area is located 1.1 miles past the southwest entrance on the park road. The marked trailhead is located on the north side of the parking area next to the restrooms. Food and water are available at the Kohm Yah-mah-nee visitor center 1 mile south on the park road. 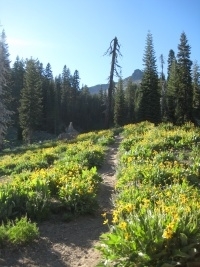 Here's the our members favorite photos of "Trails in Lassen Volcanic National Park". Upload your photo of Ridge Lakes Trail!